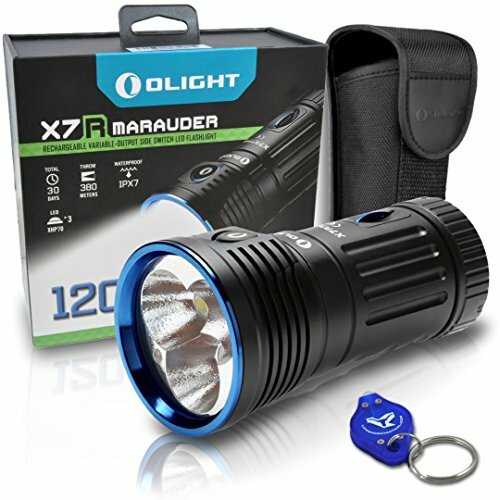 The Olight X7R Marauder is the brighter & rechargeable upgrade to the X7. Now featuring an incredible 12,000 lumen output - a 33% boost - this searchlight is perfect for outdoor sports, search & rescue, & self-defense. FAST USB-C CHARGING - Directly charge the built-in 4x 18650 batteries rapidly with the built-in USB-C charging port. An innovative twist open port cover keeps the unit waterproof as well. LONG BATTERY LIFE - Enjoy up to 30 days runtime on a single charge. A built-in power indicator will alert you when it's time to charge and also functions as a locater in the dark. INCLUDED CONTENTS - Olight X7R flashlight, holster, 4x 18650 batteries (built-in), lanyard, type-C adapter, type-C cable, instruction manual, & BONUS Lumen Tactical LED keychain flashlight.